Even if you have been fat since your early years, if your friends have been making fun of you all your life and your mom has been telling you for years that your fattiness has genetic nature, you still have great chances to get rid of extra pounds by drinking ginger tea every day. This miraculous herbal tea can really solve your problem, and you will not need to control every single calorie you consume though still leading a healthy life style is absolutely essential. Have you ever tried ginger tea, or do you know how to make ginger tea? Ginger is one of the greatest natural remedies to stimulate metabolism. Besides, its roots are rich in essential oil which contains shogaol and gingerol. These two chemical substances create specific and very spicy taste of ginger, and when we receive these two elements with ginger tea, our blood circulation and warm us up very good. In the Far East, ginger and ginger tea has been used for centuries for treating various diseases, including the problems connected with digestion. Many people wonder how to make ginger tea. All you need to do is just take a teaspoon of dried ginger root, steep it for 5 minutes in boiling water, and then add a teaspoon of honey and a slice of lemon. That’s it, your delicious therapeutic ginger tea is ready. This beautiful beverage will stimulate detoxification and help your body remove both harmful toxins and excessive amounts of fat. 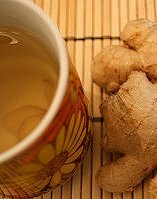 You can drink up to 1 liter of ginger tea a day, and you will be able to enjoy one more therapeutic benefit of it. If you drink a cup of ginger tea 20-15 minutes before your mealtime, your appetite will reduce and you’ll eat less. Another amazing properties of ginger tea is its abilities to receive a lasting effects in the context of weight loss. Drink ginger tea regularly, give up your bad eating habits, and you’ll be able to shed extra weight much more effectively. Hi, I just want to know, should i drink ginger tea when its hot or let it cold first and then take it? I read on internet that one should never add honey to warm water cos’ the enzymes and other nutrients in the raw honey can be destroyed. That’s confusing, please guide me whether i add honey to hot water or not and if i wait for the tea to be cold before drink it. Many thanks for your comment and your interest to my site. I’m glad to help you in finding the answers to your questions. First of all, you can drink ginger root tea the way you like it. You may like it hot when you are fighting against the symptoms of a common cold, and in hot summer days you many like it cool. It does not matter at all whether the tea is hot or cooled down. As to adding honey: if you are afraid of losing all therapeutic properties and natural nutrient content of honey, you can add it when your tea is warm (about 40C). Wishing you to stay healthy and happy for many years!